As intriguing as the possibility was, I’m now convinced that the recently discovered grave in McDuffie County, Georgia is not that of my 5x-great-grandmother. 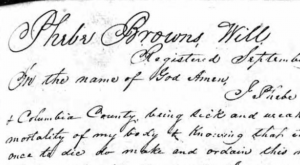 A little snooping around in the probate records for Columbia County, George (the predecessor county of McDuffie) revealed probate records for a Phebe Brown1 who died in 1839. Her will was entered into probate on September 10, 1839, just a few weeks after the death of the Phebe Brown in the newly-discovered grave – that Phebe died on July 26, 1839. This other Phebe’s will mentioned a sister, Nancy Saxon. Our Phebe had no sister Nancy. This other also Phebe mentioned her husband, Frederick Brown, in her will and of course we know that our Phebe had a maiden name of Brown, not a married name of Brown. There are several family trees on Ancestry for this other Phebe. Her parents were Rueben Rogers and Temperance James. I don’t believe this is a Quaker family. So… as fun as it was to entertain the wild possibilities, I think we’re back to the original notion that Phebe (Brown) Dill died sometime around 1815 in or near Preble County, Ohio. In the course of researching all of this, I did come across some land transactions involving Mercer Brown, Peter Dill, and other family members. I’ll be able to develop a better timeline for the family’s time in Georgia and I hope to be able to specifically locate their land ownership on a map. 1 Georgia. Court of Ordinary (Columbia County); Wills, Vol A, H, W, X, 1790-1851, image 749 of 870.